One of my younger brothers owns a weekend house on Orient Point. 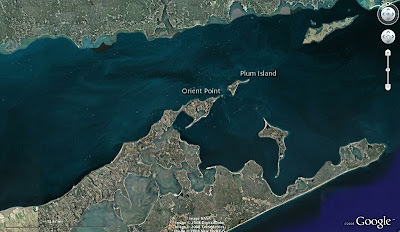 Orient is at the eastern tip of the "north fork" of Long Island. 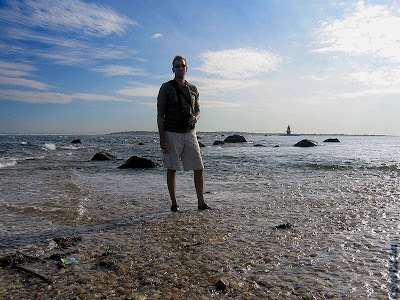 It is across the Long Island Sound from the coast of Connecticut and a virtual migrant trap for birds heading south. I was hoping to catch a glimpse of some of those birds. 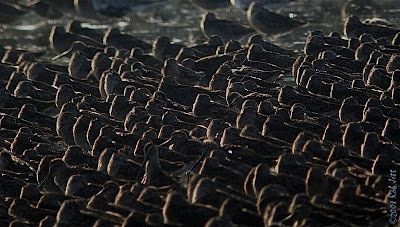 Flocks of migrating birds head for the narrowest crossing when faced with open water. Montauk Point, on the south fork, is a known location to spot birds heading south and I've traveled out there several times in the past. I've never been to the end of the north fork to look for birds, but assumed it would also be a good location. 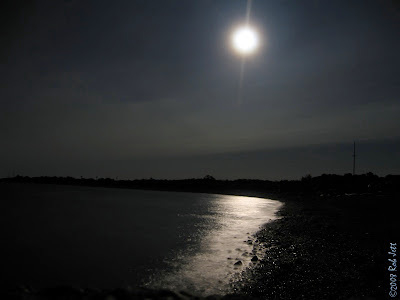 A short distance from the end of Orient Point is Plum Island. Between the two small points of land are rip currents dotted with rocky outcroppings and accented with sharp, rolling white-caps. Exposed boulders were the exclusive domain of gulls and an occasional shorebird. The Saturday morning after my arrival, I took an early morning walk down the beach to the end of the point. There was a near constant chatter of Tree Swallows flying overhead. Closer to the surface of the water I spotted small flocks of "peeps", a few Willets, several Ruddy Turnstones, a few oystercatchers and three or four Spotted Sandpipers. Also part of the full moon migration, and a bit disturbing, were rafts of Lion's Mane Jellyfish. I grew up close to the shore, so seeing these stinging animals in August isn't unusual, but the abundance was extraordinary. 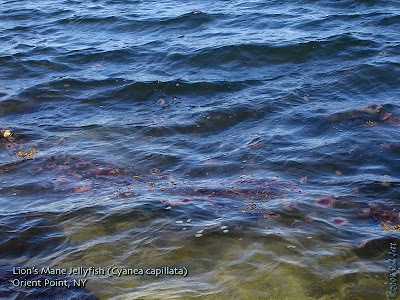 Like a red tide, the jellyfish stretched along the break as far as I could see. 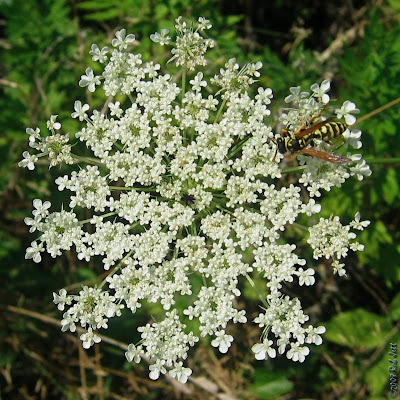 It would have been impossible for a person to swim without receiving multiple stings! At the point, I observed flocks of swallows coming in from across the water. Their numbers ranged from a few dozen at a time to a couple of thousand individuals in a flock. Once they were clear of the water, they just continued flying southwest. Later that morning I spotted a Northern Waterthrush that had landed in a wooded stretch at the edge of my brother's backyard. I pointed out the warbler to my brother and his wife, but they seemed unimpressed by the small, brown bird. The fact that this 18 gram bird was likely headed to South American sparked a little bit interest, but not the level of enthusiasm to which I am inclined when I learn about the feats of such tiny creatures. On our drive back to Brooklyn on Sunday I noticed something amazing. 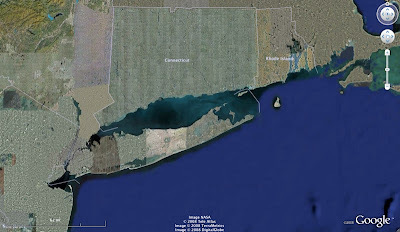 The north fork of Long Island has not suffered the endless development of the south fork. Most people are familiar with the sprawling mansions of the hamptons and Dune Road. Fortunately, the potato farms of the north fork that I remember from my childhood summers in Cutchogue have been replaced with vineyards, not mac-mansions. The views along the old Middle Road or Soundview Road, for the most part, are of grape vines and open fields, not shiny, new developments. We left Orient Point at about 6pm and, as we drove west, I noticed that we were keeping pace with flocks of swallows and blackbirds. 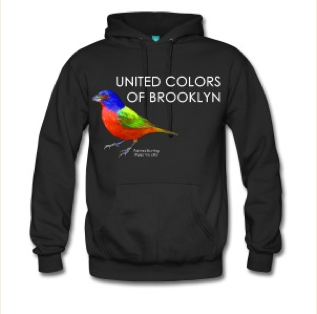 Many of those birds will pass Brooklyn and New York City and not stop until they reach the Gulf of Mexico. Some will continue following southwest, along the coast, while others will head straight out over the water. How they make that trip twice a year is nothing short of a miracle. It's been nearly 6 years since my cycling accident. Two surgeries, uncounted hours of physical therapy and, this year, I've finally returned to regular rides. Moving along on a bicycle may be ten times faster than walking, but it doesn't preclude nature observations. They are just very brief. My preferred route this summer takes me through residential areas south of Park Slope and to Jacob Riis Park, where I briefly swim before heading back north. Last Thursday, after work, I took a quick ride. At the intersections of Argyle and Elm Streets, a car creep past the stop sign and into my path. I can make an obnoxiously loud, bicycle messenger-like whistle, so I let loose a squealing "wheet, wheet". A few seconds later, from an opened window in a house to my right, came a parrot's mimicked "wheet, wheet". I heard a second call as I flew passed the row of two story homes. I chuckled and wondered if I had inadvertently added to someone's parrot's repertoire of calls? The most noticeable changes along my route has been among the trees. 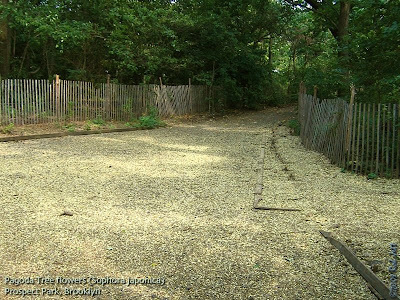 From Prospect Park to Marine Park, Norway Maple are releasing their helicopter-like seed pods, or keys. Oaks are already dropping acorns. When I run them over, they either get crunched or launched from between my tires and the road, pinging off of the sides of parked cars. Black Cherries have fully ripened and, the ones that don't get eaten by the birds, tattoo the roads and sidewalks beneath the trees. My tires bear purple stains from the cherry juice colored pathway at Flatbush Avenue where it passes over the Belt Parkway. Pagoda Trees, the last flowering trees of the summer, has sprinkled many streets with their golden yellow, popcorn blossoms. 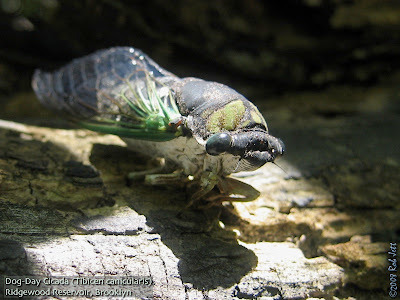 The Dog-Day Cicada's churring songs now dominate the summer sounds. Near the corner of Church Avenue, the chainsaw-like crescendo of cicada calls owned the airwaves, out performing even the Hip-Hop back-beat coming from pounding woofers in a parked car. Flocks of Sanderlings have been increasing in abundance along the beaches. Fort Tilden and Riis Park seem to be a staging area for the migrating shorebirds. This last week saw the greatest increase. As I was watching some of these tiny, gray and white birds chasing the edge of the surf in search of food, I noticed something curious. Many individuals periodically assumed an aggressive posture when near another bird. They'd lower their heads, hunch their backs and face off like a pair of Sumo wrestlers. Where are the cute, peaceful birds that I am accustomed to seeing in large, cooperative flocks along the shore during winter months? Maybe they are still cranky from the long flight south. At Bay 8 beach, an adult oystercatcher provided shade for a very young hatchling. At this time of year, most American Oystercatcher offspring have fledged. Perhaps this individual is the result of a second or third brood. It is so late in the season, I hope it survives. "JERRY: You ran over some pigeons? How many? GEORGE: What ever they had. Miranda thinks I'm a butcher but i-i-it's not my fault is it? Don't we have a deal with the pigeons? JERRY: Course we have a deal. They get out of the way of our cars, we look the other way on the statue defecation. GEORGE: Right! And these pigeons broke the deal. I will not accept the blame for this!" Today I felt like George, the only difference was that I was cycling. Like most New Yorkers, unless one is being eaten by a hawk or falcon, I pretty much ignore pigeons on a daily basis. When I'm cycling, if there are any in my path, I rarely apply my brakes as they always move out of the way. Well, almost always. I was near the Parade Grounds pedaling up Argyle Road when I approached a flock of about six pigeons standing in the middle of the street. 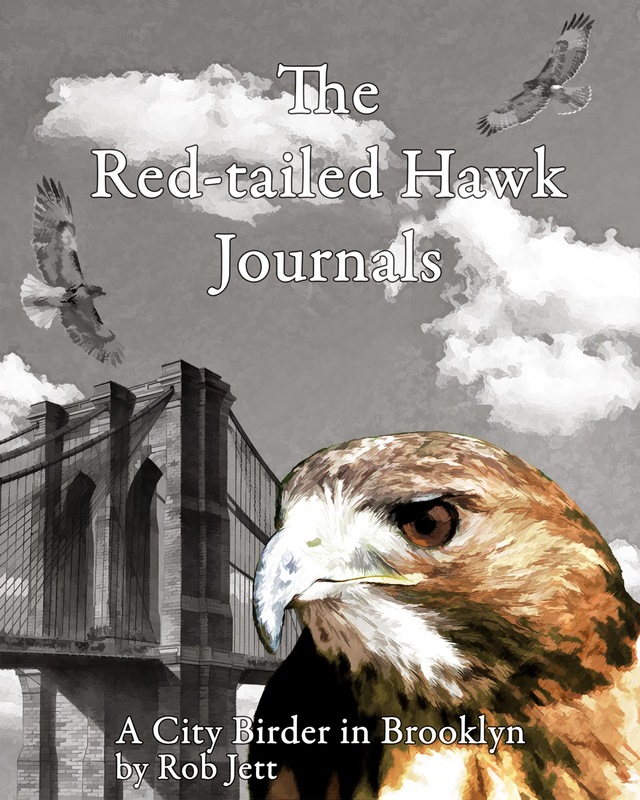 Five flew out of the way while I was still several yards away from them, the six hesitated. At the last moment he flew towards the parked cars, but I clipped the back end of the bird with my front wheel. Birds are surprising light weight and I didn't feel a bump or any vibration up through the bike frame. I looked to my right in time to see the bird spin 180 degrees and hit the tire of a parked car. In seconds, he righted himself, then flew off to join the other five birds. They say that New Yorkers are a tough lot, but I think New York pigeons win the prize for surviving a daily barrage of automobiles, bicycles, dogs, pedestrians and, of course, birds of prey. 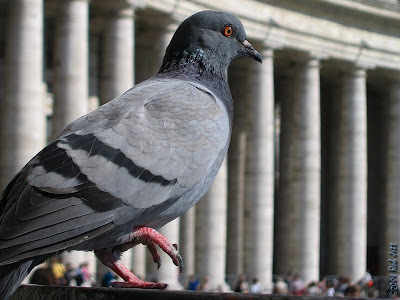 At only 9 ounces, the lowly Rock Pigeon not only survives, but seems to thrive in the "City that never sleeps". I may have to rethink the whole "deal" thing. It really feels like summer, but fall migration is well underway. Last Friday (August 1st) Doug, Shane and I went over to Jamaica Bay Wildlife Refuge to check out the shorebird migration. 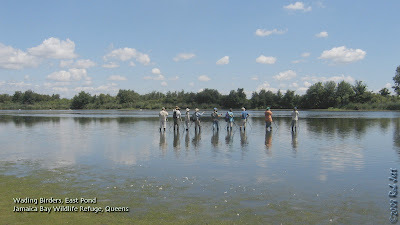 Water levels on the East Pond had begun to recede (naturally and by the opening of the valve on the north end), creating a narrow ring of shoreline between the water and encircling phragmites. At this time of year there is a predictable cycle of activity on the refuge's ponds. The shorebirds forage for insects and tiny marine invertebrates on the exposed islands, mudflats and bars in the bay at low-tide. When those areas are flooded at high-tide, many fly over to the East and West Ponds of the refuge to rest along the shoreline or to continue feeding. The brevity of most shorebird's breeding season is astounding. Many of the various species of shorebirds or waders are long distance migrants. They spend their winters in Central or South American. Come spring, they fly to breeding grounds within the nearctic, thousands of miles away. Out of curiosity, I began to search through reference guides to locate data on how much time one of these species of shorebirds might spend traveling and how much time they remain on their nesting grounds. Over a dozen species of shorebirds might pass through New York City during a busy migration period, one is the Semipalmated Plover. 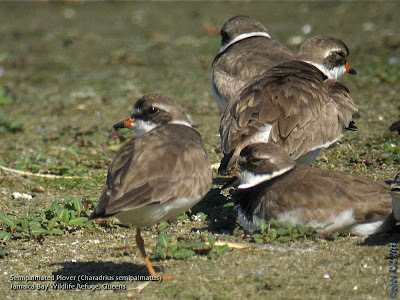 Semipalmated Plovers winter as far south as Argentina and, according to "Bull's Birds of New York State", begin to arrive around New York in late-April. After a short respite, they continue north to find a mate and nest somewhere within the south tundra. The females will lay a clutch of from 3 to 4 eggs that hatch in a little under a month. The fairly independent hatchlings fledge about 3 to 4 weeks later. Like the frantic rabbit from Alice in Wonderland, the impatient adult shorebirds rush off on the return trip before their offspring attempt the flight. Early returning Semipalmated Plovers can be observed at Jamaica Bay Wildlife Refuge by mid-July. 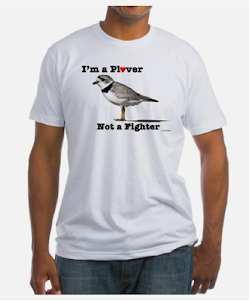 So, on average, a Semipalmated Plover spends around 6 weeks on their nesting grounds. I used Google Earth to measure a point along the coast of Argentina within these bird's known winter range, to a point near Hudson Bay within their known breeding grounds. The straight line distance was approximately 7,500 miles. An individual bird making that trek would more likely follow the coast, so the distance would in reality be greater. Conservatively, it could take 2 weeks to get to the tundra and 2 weeks to get back, so that's a month of flying. Using my unscientific estimates, that means a Semipalmated Plover could spend around 10 - 12 weeks just traveling or raising their young. The bad news is that they don't receive any frequent flyer mileage. The good news is that the world population of Semipalmated Plovers doesn't seem to have suffered from this grueling schedule. The better news (for birders, anyway) is that sometimes nearctic breeding shorebirds inadvertently stray from their normal routes. For example, if a Siberia nesting shorebird heading south towards its wintering grounds in Australia veers a little to the right or left, it can end up somewhere along the coast of North America. Such was the case last week at the East Pond of Jamaica Bay Wildlife Refuge. On that Friday morning Shane met me up in front of my apartment at 6:15am, we picked up Doug, then the three of us headed off to Jamaica Bay Wildlife Refuge. It was just after sunrise and I was really excited as it would be my first day of the 2008 Fall shorebird migration. Both Doug and Shane had already spent a few days birding at the refuge's East Pond and reported increasing numbers of Semipalmated Plover, Greater Yellowlegs, Lesser Yellowlegs, Semipalmated Sandpiper, Least Sandpiper and Long-billed Dowitcher, to name a few. 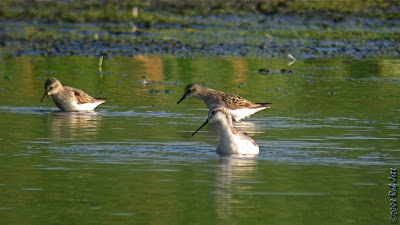 A pair of rare Wilson's Phalarope were also present. There was a cool, steady breeze blowing in from the north, making it feel more like late-September than early-August. Access to the north end of the East Pond is through a narrow, 100-yard path cut through a dense jungle of common reed. The trail fans out onto a muddy, sulphurous viewing area at the northwest corner of a, roughly, rectangular 1 1/4 mile long pond. Rubber boots are necessary to travel south along the edges as the water level is still relatively high and mud, absolutely deep. Flocks of chattering, peeping Semipalmated Sandpipers, Least Sandpipers, yellow-legs and dowitchers were feeding in shallow water adjacent to the trailhead. One, nearly all white, shorebird turned out to be a Wilson's Phalarope that was found earlier in the week by Doug and Shane. Phalaropes have several interesting feeding techniques, but one sets them apart from pretty much all the other shorebirds. 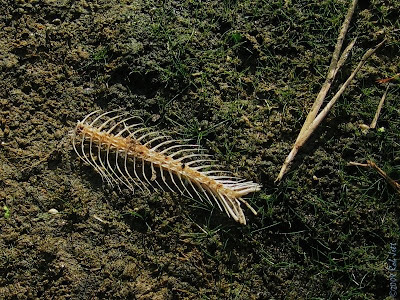 Using their lobbed feet as paddles, they spin around in a circle, like a circus performer, stirring up insect larvae or arthropods then snapping up the food from the surface of the water. It's pretty funny to watch, but I probably shouldn't laugh at them as we likely look similarly amusing to them when we eat spaghetti. We continued walking south, along the west side of the pond. The water level still reached the reeds in most places. There's a small cove next to a point on the map labeled "Sanderling Point". It not very wide, but needs to be navigated carefully if one wants to bird more than just the northern quarter of the pond. By the end of August it's surface is hardened, dark gray mud etched with deep cracks, but it was August 1st and we had to choose our steps carefully or sink to our waists in muck. South of the cove there were several mixed flocks of shorebirds spread out along a dry stretch between the water and phragmites. After carefully crossing to the south end of the cove, we set-up our scopes to pick through the birds. Bob Kurtz, a long time New York City birder, was the only other person at the pond. Doug, Bob, Shane and myself spent about 2 hours scanning the large flocks of birds from the west side of the pond before walking back towards the cove. It had been a very good morning for abundance and diversity of birds, especially considering that we never went anywhere else in the refuge. At least I was happy. 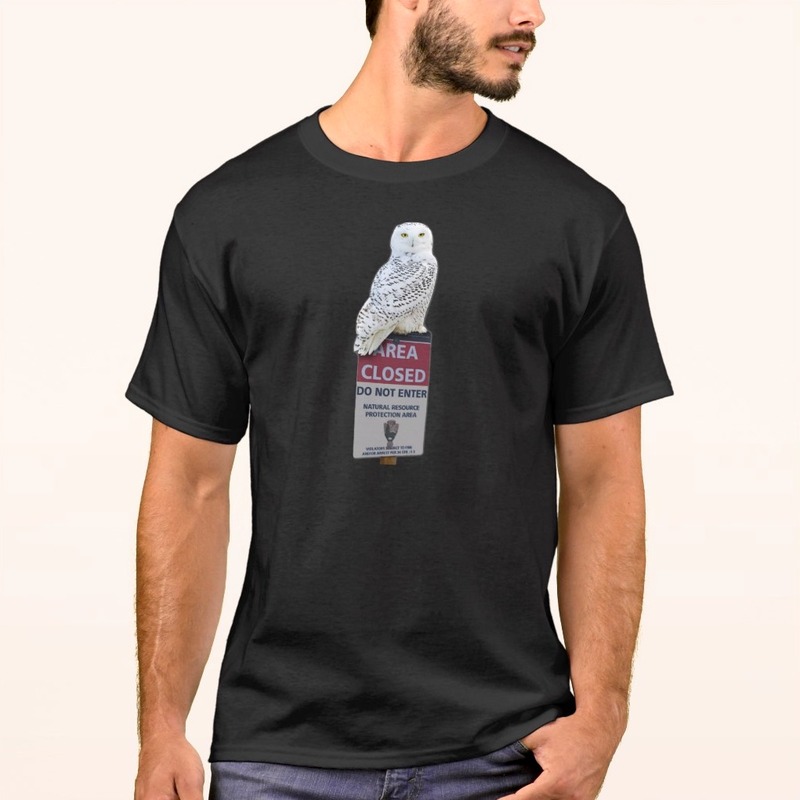 Most people who know him, would agree that my friend Shane is an exception birder. He is careful, knowledgeable and always telephones people whenever he finds something special in the field so that they can get to see it. He is going to hate me for posting this on my blog, but he is also the most competitive person I know. Now there is a point for me mentioning this with regard to Friday's birding. As Bob, Doug, Shane and I were walking north, ostensibly to leave the refuge, Shane commented, "I can't believe we didn't find a stint." He sounded seriously disappointed, despite the fact that stints are rarely found at Jamaica Bay Wildlife Refuge or anywhere in the state. 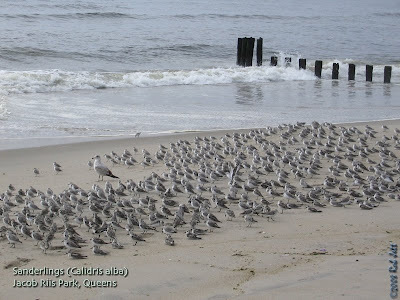 They are an Eurasian species of shorebird that has been observed in New York State five times since 1985. Apparently, Shane wanted to see the sixth. We had stopped briefly, just short of crossing back over the cove. Bob, Shane and I were yapping about something, while Doug scanned the other side of the narrow stretch of water. Suddenly Doug said something like, "Hey guys, there's a really bright red shorebird in front of us." I swear I could hear the wind from Shane's head as he spun around to focus on the bird. It was unlike any sandpiper I had ever seen. Bob said it was a stint. Doug, Shane and I looked in our field guides. 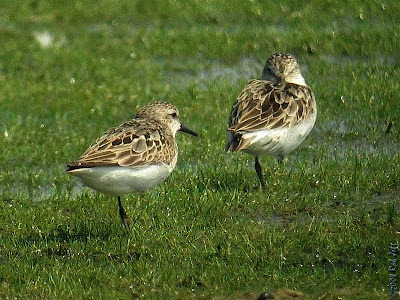 Bob repeated that it was a stint, a Red-necked Stint. We couldn't believe our luck and wanted to make absolutely certain of the bird's ID. I think we all knew pretty quickly, as it was in very bright breeding plumage and would be difficult to mistake for anything else. People would be dropping everything to come look for this bird and we didn't want to disappoint (or look like idiots). 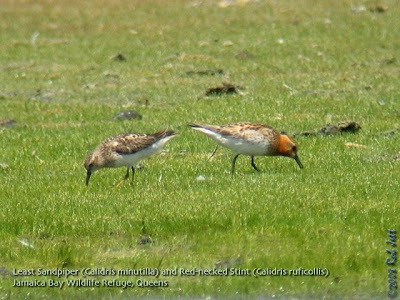 Doug, Shane and I went back and forth for a few minutes, checking field marks, before turning to Bob, who replied, once more, "It's a Red-necked Stint." Bob was the only one among the four of us who had ever seen one, in fact, he'd seen several. The bird eventually flew across to the east side of the pond where it fed along a stretch of shoreline just north of a small island. Several phone calls later, the word was out and people were already in their cars heading towards the refuge. 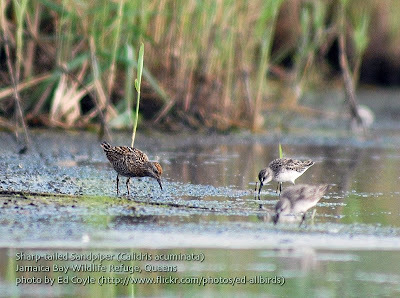 Over the next two days a couple of hundred people would make the trek to the East Pond of Jamaica Bay Wildlife Refuge to see the brightly colored sandpiper from Siberia. Saturday was pretty much a lost day for me. My wife's 15 year old nephew was flying in from North Carolina to spend a week with us. The flight kept getting delayed, it finally landed but they didn't have a gate, you know the routine, but I shouldn't complain because at least I wasn't the one stuck on the airplane. On Sunday morning I received a phone call from Doug. He was back out at the refuge on the East Pond. In his usual, high-speed, mumbled style I heard the words "sandpiper" and "sharp-tailed". He slowed down enough for me to understand that the Red-necked Stint was still at the refuge, but there was now also a Sharp-tailed Sandpiper present. This shorebird species has only been seen at the refuge once. Apparently, the stint wasn't the only bird in Siberia that was directionally challenged. I told my nephew, Brandon, that after breakfast we would be taking the subway out to Jamaica Bay Wildlife Refuge. I also warned him to prepare for a total birding "geekfest". It was the weekend, the weather was beautiful and there was, not only an abundance of common shorebirds, but two extreme rarities on the East Pond. Brandon is not into birdwatching, but I figured what 15 year old boy wouldn't mind spending the morning slogging around in the mud. During breakfast I had three field guides spread out on the kitchen table. I gave him the short lesson on shorebird migration and vagrants before we headed out towards the subway station. I don't always chase rare birds, in fact, during my 2006 "Big Year", I think I probably burned out on that aspect of birding. This was different, though I'm not sure why. Perhaps it was that the season had just begun and I was still excited about the flood of arriving migrants. When Brandon and I walked onto the East Pond there were already about 50 birders present. As we hustled south towards the group still watching the Sharp-tailed Sandpiper, I did something that I'm ashamed to admit. Several yards into the walk, I noticed the Wilson's Phalarope spinning in the shallow water. I pointed and said, "There's the phalarope" and kept walking. Just short of the curve in the shoreline near the cove, I stopped to scan the opposite shore for the stint. I got it in my scope almost immediately, looked at it for about 10 seconds said, "stint is on the other side", picked up my tripod and continued walking. I nearly lost Brandon in the quicksand-like mud around the cove, but we arrived at a group of about 15 people looking across the water at the sandpiper. As I was looking at the uniquely marked bird I thought, "I can't believe that I just did that." Have I become an MTV generation birder where even the "special" birds become yesterday's news overnight? Shane and Doug were already at the East Pond, enjoying well-lit, but distant views of the Sharp-tailed Sandpiper. The bird remained on the east side of the pond, while all but one birder stayed on the west. We drove back to Brooklyn with them, saving us a long subway ride. Before leaving, Doug and I arranged to meet the next morning, before sunrise, so that we could get to the refuge before the "crowds" and take some photographs of the sandpiper. We planned to walk up the east side from the "South Flats" and, hopefully, not get stuck in any muck. The weather cooperated and we were able to make our way up to the small spit where the sandpiper had been observed. It was 7:45am when the bird stepped out of the shadows and on to the shoreline directly in front of us. Eventually, several birders arrived on the opposite shore and set-up their scopes. Doug called Lloyd, who was with the group, to direct them to the bird's location. Unfortunately, before we left, a Peregrine Falcon began swooping low over the pond. Thousands of panicked shorebirds zipped back and forth across the long, narrow pond. The falcon disappeared, but returned a few minutes later, this time he actually dipped into the water briefly before heading north. Doug and I never saw the Sharp-tailed Sandpiper again. The Red-necked Stint was reported later in the day, but by the next morning both birds and many of the other shorebirds had moved out on the overnight cold front. Maybe when the next cold front pushes through, the "Siberian Express" will be transporting another interesting passenger or two on board. With a little luck, my friend Shane will find himself another stint.